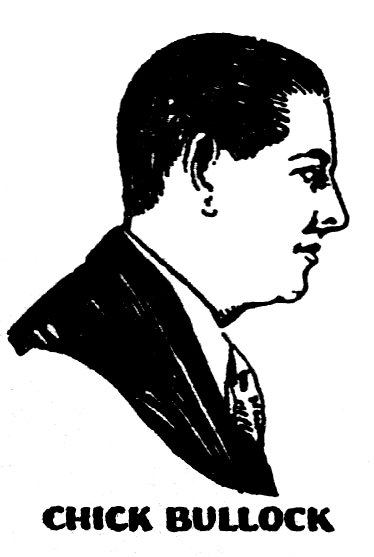 An illustration of Bullock in his prime, from 1930s “Perfect” record sleeve. One of the most prolific male vocalists of the 1930s was Charles “Chick” Bullock. With his relaxed style and smooth tenor voice, Bullock recorded innumerable titles with groups ranging from sweet dance orchestras like Waring’s Pennsylvanians and Ed Kirkeby to hot jazz bands like Cab Calloway’s orchestra and the Mills Blue Rhythm Band, even Antobal’s Cubans as “Chiquito Bullo”, as well as his own group, the Levee Loungers. Over the course of his career, Bullock worked with many, if not most, top musicians of the 1930s, recording hundreds of sides. In fact, if you pulled out any record from the ARC labels (Banner, Perfect, Romeo, et al), there’s a good chance you’ll see “vocal chorus by Chick Bullock”. Charles Sibley Bullock was born September 16, 1898 in Butte, Montana to British parents William (b.1858) and Emily Bullock (née Sibley) (b.1872), an engineer and teacher, respectively, who met and married after emigrating to the States. Though his family wanted him to pursue a career as a doctor, he was destined for a life in the show business. His first job in the entertainment industry had him working as an illustrated song performer between acts on the vaudeville stage. Later, he worked his way from venue to venue into motion pictures, scoring a few small parts in silent films, but soon found he preferred singing, and left Hollywood to pursue a career in music. In Salt Lake City, Bullock met Mary Newton, whom he would marry soon after. 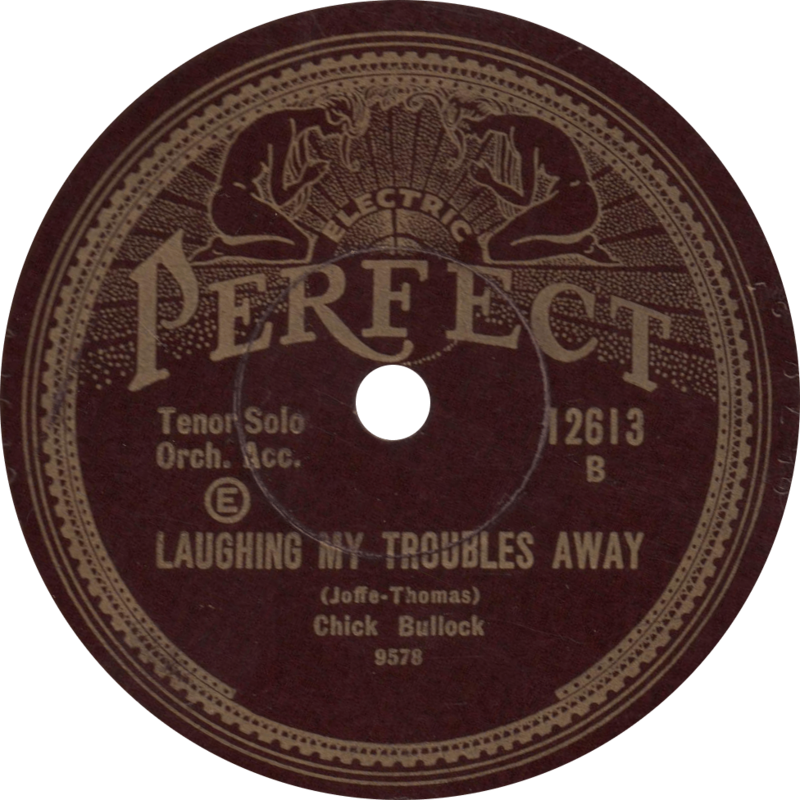 One of Chick Bullock’s earlier recordings (his seventh), illustrating his early singing style. Recorded April 4, 1930. By 1929, Bullock was singing on the radio, and early in his singing career, Paul Whiteman offered to take Bullock on with his orchestra, as he had done with others like Bing Crosby or Irene Taylor, but Bullock declined. Soon after in 1930, he was offered a contract with the American Record Corporation, which he accepted. Bullock proved himself quite a versatile song spinner, singing everything from standard popular fare to jazz to blues, with two of his earliest recordings being St. James Infirmary and Alcoholic Ward Blues, but the ARC often had him singing ballads and love songs. 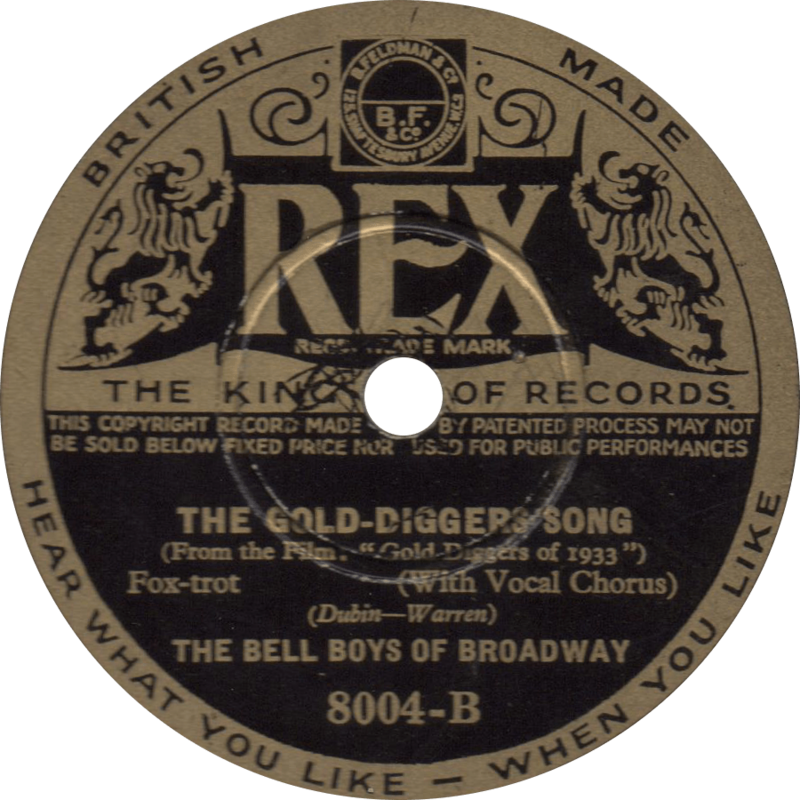 Chick Bullock sings the theme song of “Gold Diggers of 1933” with Gene Kardos’ orchestra, recorded May 5, 1933 (British issue shown). After the success of his first record, Paramount Pictures wanted to star Bullock in a musical short, but an deformity of the eye prevented him. In Bullock’s own words, “Just woke up one morning with it. The pupil of my right eye went all black.” A family source indicates that the deformity was caused by damage from harsh stage makeups of the day, and the only known photographs of him show him in profile. Though he had a number of operations attempting to repair the afflicted eye, they were to no avail, and Paramount decided cast another up-and-comer for the picture by the name of Bing Crosby. The deformity prevented Bullock from appearing live and in moving pictures, and kept his work confined to radio and recording, where he found great success. Bullock’s 1930 to 1941 engagement with the ARC had him record a great deal of popular songs of the era. 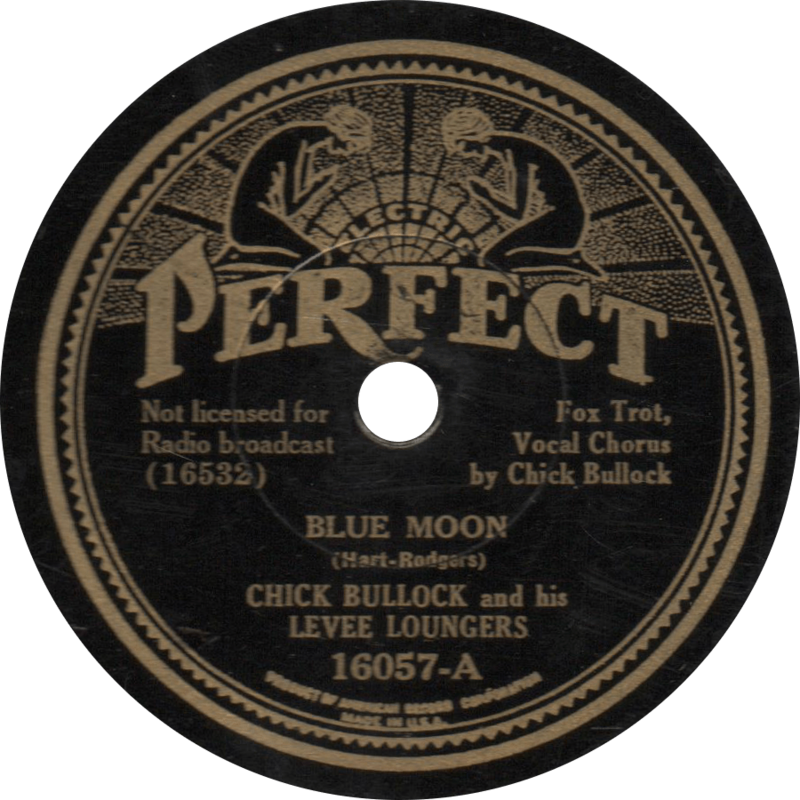 Chick Bullock sings Rodgers and Hart’s famous “Blue Moon”, recorded December 22, 1934. Chick Bullock was still going strong by the close of the 1930s, but in 1941, at the start of the musicians’ strike, he packed up and quit. Preferring to work with a musical backing, rather than a vocal group, and perhaps spoiled by having been backed by some of the greatest musicians of his day, he left the recording industry, retiring to California, where he took up real estate. Over the course of his career, Bullock worked extensively with such names as Joe Venuti, Eddie Lang, Benny Goodman, and a great many others. One 1931 session at Brunswick placed him with such talent as Red Nichols, the Dorsey brothers, and the Boswell Sisters for the recording of their “California Medley”. After a long retirement in California with his wife, actress Mary Newton, Bullock consented to an interview with Jazz Journal in 1974, revealing more about his previously secretive and mysterious life (and making this article possible). Bullock passed away September 15, 1981 at the age of 82, one day before his birthday. This entry was posted in Spotlight and tagged 1930s, ARC, Chick Bullock, Gene Kardos, Jazz, Popular, Radio, Vaudeville by R. Connor Montgomery. Bookmark the permalink.